Cornell is yet to record a victory over a D1 team. Wisconsin, Michigan State, Minnesota and Nebraska are a combined 39-5 at home…four of the losses have come vs. Michigan. Stephen F. Austin’s conference schedule started with five on the road…they won all five, four by double-digits. My-oh-my. They have won 16 in a row and are 8-0 in the Southland. Eight of their final-11 are at home. I like their chances. Just three teams have two wins vs. ranked teams and zero losses to teams ranked outside the top five…Arizona, Syracuse and San Diego State. Blimey! Nova won, but combined with Georgetown for 34 turnovers and 39 fouls on Monday night. VMI has scored over 100 points six times so far this season. The ACC is ranked #5 by RPI…29-33 vs. other power conferences. Duke has not allowed more than 65 points per game during the current five-game win streak. In a four-minute stretch, Duke got ten consecutive defensive stops against Pitt. Part of Coach K’s defensive plan this year is to limit quantity of 3-point attempts by the opponents…percentage made is up, but Duke has allowed significantly fewer 3-point attempts than any other ACC team. Duke is +14 in free throw differential…6th best in the ACC…Pitt at +66 is #1. Duke has led at the half in every game this season, except UCLA…that was a tie. Tricia Liston became the Duke women’s #1 in 3-pointers over the weekend. Thursday, she led the way with 29 points in the victory over Miami…without hitting a trey. 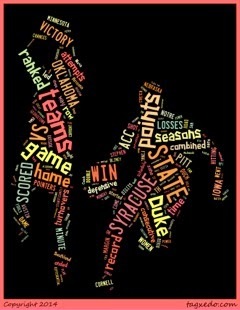 Sunday at 2 PM on ESPN, it’s #2 Notre Dame at #3 Duke in a great women’s match-up. When Iowa went ice cold vs. Michigan State, they shot 1-13 over a 15-minute period. Ouch! Iowa is 1-5 against teams ranked in the Top-25. Creighton’s Doug McDermott scored 39 points and hit the game winning 3-pointer vs. St. John’s…no other Blue Jay scored more than seven. Kansas has McDonald's All-Americans and top-50 guys that aren't even in the rotation. According to Peter Tieman of Bracket Science, there are six telltale signs for a Cinderella. 1) Wide turnover margin. 2) Tournament experience. 3) High volume 3-point attempts of more than 39.5%. 4) Teams that hold opponents below 33.3% shooting from beyond the arc overachieve. 5) Average scoring margin greater than 15. 6) Upper-class laden teams…three seniors and no freshmen starters is the magic mix. Last six games, Ohio State is 1-5 and the opposition has shot 57% on their 2s. Penn State’s victory ended an 80 home game consecutive win streak vs. unranked teams for OSU. Last five games: Iowa State is 1-4…with Oklahoma and Oklahoma State up next. Ooops! Last five: Wisconsin 1-4. Northwestern’s win at Wisconsin marked just the second time in 16 years the Badgers have lost back-to-back at home. Syracuse’s record through 18 games the past four seasons is 70-2. Record the rest of the way the four seasons is 36-16. The Syracuse zone is more a morphing zone than strictly a 2-3. Trevor Cooney has taken close to 50% of Syracuse’s threes. Syracuse has outrebounded everyone except Pitt. Chattanooga had won ten in a row and was 8-0 in conference, before they went to Davidson and got beaten by 43 points. Ouch! The Pac-12 is inconsistent…but dangerous. They’ll pull some upsets in March. Not so fast: Lest we forget, Notre Dame is clearly the most experienced ACC team with veterans at every position. One more thing: For the 10th straight time, Oklahoma beat Oklahoma State in Norman.